China is investing billions of dollars in infrastructure and developments in Sri Lanka, but many local citizens feel the country is being sold to the Chinese. Normally the roads leading to Asian ports are bustling. Trucks loaded with cargo. Small shops where lorry drivers and workers take a tea break. The Hambantota port in southern Sri Lanka is starkly different. Despite being open for seven years, the access road looks barely touched. And when we eventually found it (signage is not its strong point and locals seemed pretty uncertain of its whereabouts too) ours was the only vehicle. Except for the few security staff accompanying us, there was no-one at the site. A car carrier eased its way out of the port, after dropping off vehicles from Asia’s auto giants. But the next ship wasn’t due for two days. And for a port that cost more than US $ 1 billion (£ 770 million), that is just not enough business. But now Sri Lanka is struggling to repay that money and so has signed an agreement to give a Chinese firm a stake in the port as a way of paying down some of that debt. The terms of the deal are still being debated in Sri Lanka’s parliament, but the share it gives could be as high as 80 percent. The vision for Hambantota was that it would bring more ships to Sri Lanka and ease pressure on the Colombo port, one of Asia’s most important container terminals. Sri Lanka is located on the sea route that sees oil shipments travel from the Middle East, making energy security a key reason China was keen to invest. But it also fits neatly into China’s controversial One Belt, One Road initiative, building road, rail and sea links to boost trade with countries around the world. Hambantota has struggled to make money, partly because it is fairy isolated. With no industrial hub nearby, there are no natural customers on its doorstep. But now that China looks set to take control of the port, that is a problem it wants to fix and is talking to the government about plans to create a large economic zone - buying 15,000 acres of land to build factories and offices. But many who live in the area don’t want to give up their homes and farms. At a small village near the harbour, locals are furious about the plan. Many of them participated in a large protest against the investment hub in January. Police used tear gas and water cannon to disperse people. Some protesters were jailed for weeks, which has only deepened the anger. But these deals look like Sri Lanka’s best way of paying down some of the $8bn it owes China. The island’s total debt stands at $64bn. About 95 percent of all government revenues go towards debt repayment. And when some of that money borrowed has been seemingly squandered on infrastructure that shows no sign of turning a profit, that is even more damaging. 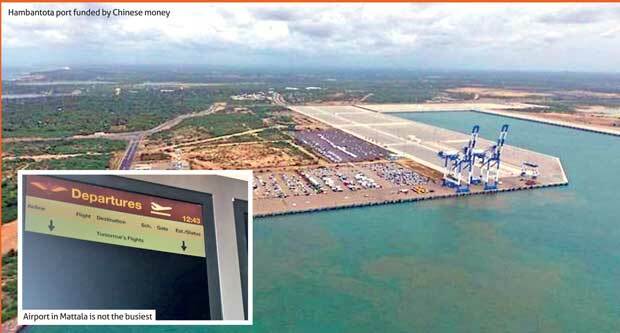 At the international airport, barely 30 kilometres from Hambantota, just five flights take off every week serving just a few hundred passengers. Then there is a state-of-the-art conference centre that is barely used and a cricket stadium now only occasionally rented out for weddings. But not all of China’s developments in Sri Lanka have proved a flop. Roads and highways are being laid all over the country, and some have really shortened travel time between towns and cities. This has helped boost tourism, the country’s biggest source of foreign income. “In the near term, there will be some local jobs for Sri Lankans,” says Angela Mancini, who advises businesses and governments on investments. Many of the China-funded projects were planned and constructed during the tenure of previous President Mahinda Rajapaksa, and are located in his electoral constituency. A new government came to power in 2015, pledging to reduce Sri Lanka’s reliance on China, but financial pressures have forced it to tow the same line. It initially suspended a major project that China had invested in - a brand-new city being built off the coast of Colombo on reclaimed land. But the US $ 1.4 billion it was bringing in proved too hard to turn away, and development resumed last year. So at Colombo’s historic Galle Face seaside promenade, from where once you could only see waves and the horizon, now there’s a fresh piece of land jutting out into the Indian Ocean. The hope is to transform it into a modern city by 2040, with swanky corporate buildings, shiny apartment blocks, hotels, resorts, beaches, malls and even a marina. The first part of it will be available for use in two years. China Harbour Engineering Company (CHEC), which is building the city, will get about two-thirds of the marketable land on lease for 99 years in return for its investment. “What this project will bring to Sri Lanka is foreign direct investments estimated at US $ 15 billion,” says Thulci Aluwihare of CHEC Port City Colombo. Once again, the government has faced opposition. Groups of fishermen and locals have held protests and demonstrations. Some are worried about the environmental impact of the project. They are not convinced by the studies done by government agencies, who have given it the all clear. But many are also concerned about the growing Chinese influence in the country. At the moment though, Sri Lanka’s government doesn’t have much room to negotiate. And Foreign Minister Ravi Karunanayake says they need to welcome everyone with open arms. “We love the Indians to come in, we love the Chinese to come in, we love the Japanese to come in. Koreans or European, we have no problem at all.